After completing my PhD I had several postdoc positions in Bonn, Cologne, Trieste and Klosterneuburg before joining the Faculty of Mathematics at the University of Vienna. My interests include algebraic and enumerative geometry, and connections with representation theory, combinatorics and number theory. Anton Mellit. Integrality of Hausel–Letellier–Villegas kernels. Duke Math. J. 167 (2018), no. 17, 3171–3205, 2018. Erik Carlsson, Anton Mellit. A proof of the shuffle conjecture. J. Amer. Math. Soc. 31 (2018), no. 3, 661–697, 2017. Frits Beukers, Henri Cohen, Anton Mellit. Finite hypergeometric functions. Pure Appl. Math. Q. 11 (2015), no. 4, 559–589, 2015. Sergey Galkin, Anton Mellit, Maxim Smirnov. Dubrovin's conjecture for IG(2,6). Int. Math. Res. Not. IMRN 2015, no. 18, 8847–8859, 2014. Adriano Garsia, Anton Mellit. 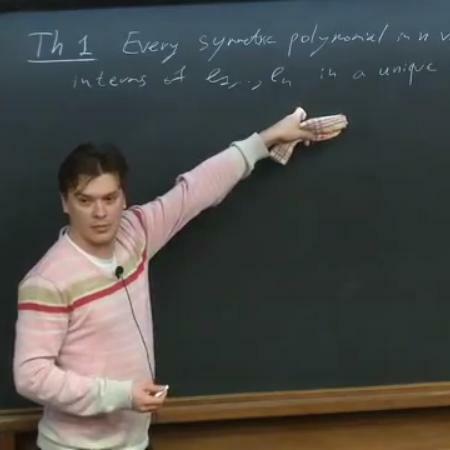 Five-term relation and Macdonald polynomials. J. Combin. Theory Ser. A 163 (2019), 182–194, 2018. Andriy Bondarenko, Anton Mellit, Andriy Primak, Danylo Radchenko, Maryna Viazovska. There is no strongly regular graph with parameters (460, 153, 32, 60). Contemporary computational mathematics—a celebration of the 80th birthday of Ian Sloan. Vol. 1, 2, 131–134, Springer, Cham, 2018, 2018. Anton Mellit, Masha Vlasenko. Dwork's congruences for the constant terms of powers of a Laurent polynomial. Int. J. Number Theory 12 (2016), no. 2, 313–321, 2015.